The pump is a simple robust mechanical construction driven by state of the art variable hydraulics in turn controlled by electronic proximity switches to determine position and direction of the main ram. The pump body and the valve boxes are one piece steel fabrications. The sludge ram is manufactured from stainless steel. 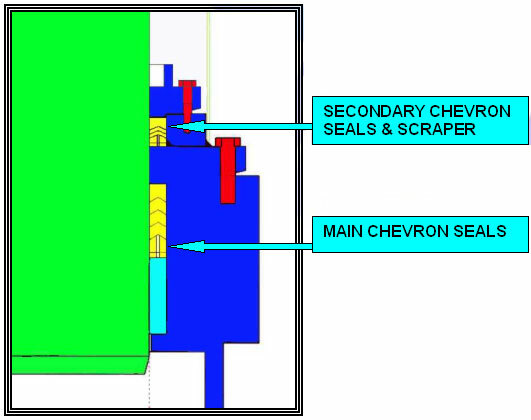 The sludge seals are maintenance free dual chevron rings, which are replaceable as a service item without the removal of the sludge ram. The first set of rings provide the initial seal between the main ram and the gland housing, with the upper chevron providing a secondary seal and scrapper facility to ensure clean efficient reciprocation of the ram. Light weight, easily removable, guards enclose the exposed portion of the sludge ram and hydraulic cylinder piston rod. Delivery sludge dampers are provided to eliminate the hammer due to the pulsating action of the pump. These dampers are not coded pressure vessels. The hydraulic cylinder driving the sludge ram is built to off shore specifications and is of a hardwearing design featuring a chrome piston rod. The hydraulic cylinder also features extensive internal guidance and support for the piston rod thereby eliminating lateral forces upon the hydraulic seals, which can promote oil leaks. The top of the hydraulic cylinder features internal, hydraulic cushioning to facilitate absolute control over the sludge ram at the top of the stroke where the ram changes direction from up to down. This contributes to the quite operation of the pump. The hydraulic cylinder is supported upon a fabrication mounted on top of the pump body through which the chrome piston rod passes.